Tostones! 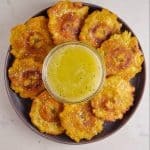 Can you believe I’ve never made tostones at home before? I order them at restaurants all the time, but I thought they would be a pain to make. To my surprise they were quick and easy to make, which is a bad thing because they will be consumed so much at home now. Let’s start with picking plantains. You want to get plantains that are green because the more yellow they are, the more ripe. 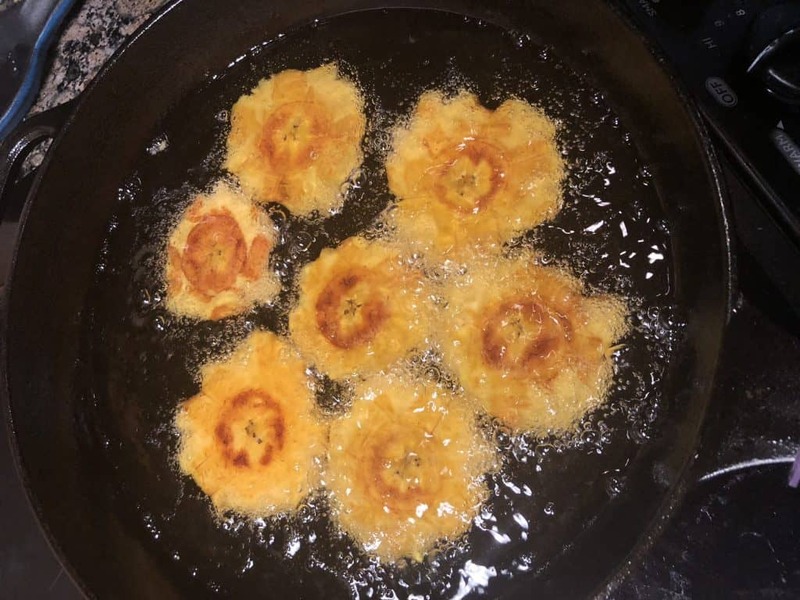 Yellow ripe plantains are great for making regular cooked plantains, but the sweet flavor doesn’t lend itself well for fried tostones. Once you have your green plantains, you want to cut the tips off and make a cut down the skin of the plantain. Using a spoon or finger, peel the skin off the plantain. It might be a little difficult to loosen it up since it’s not ripe, but using a spoon should assist in peeling. Then you want to cut them into 1-inch pieces. 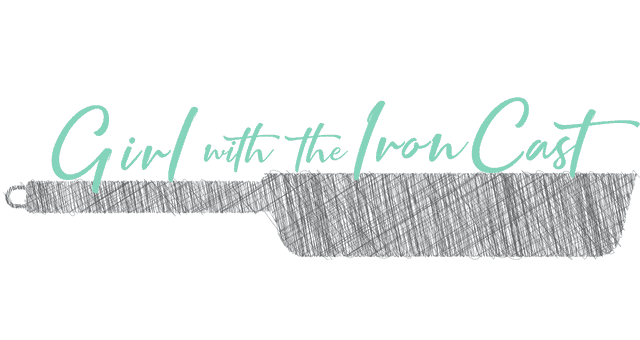 Using a frying safe skillet (cast iron, dutch oven, etc.) add a 1/2 inch of canola oil (or your preferred frying oil) and heat over high heat. I say 1/2 inch of oil because it depends on the size of your skillet for how much oil you’ll be adding. Pictured above is my 12 inch cast iron skillet for reference. You’re going to want to fry them on each side for 3-4 min until slightly browned. Remove from the oil and place on a plate lined with paper towel to absorb excess oil. After you have removed the plantains from the oil, it’s time to smush them (obviously my favorite part, see smashed potatoes for more smushing fun). 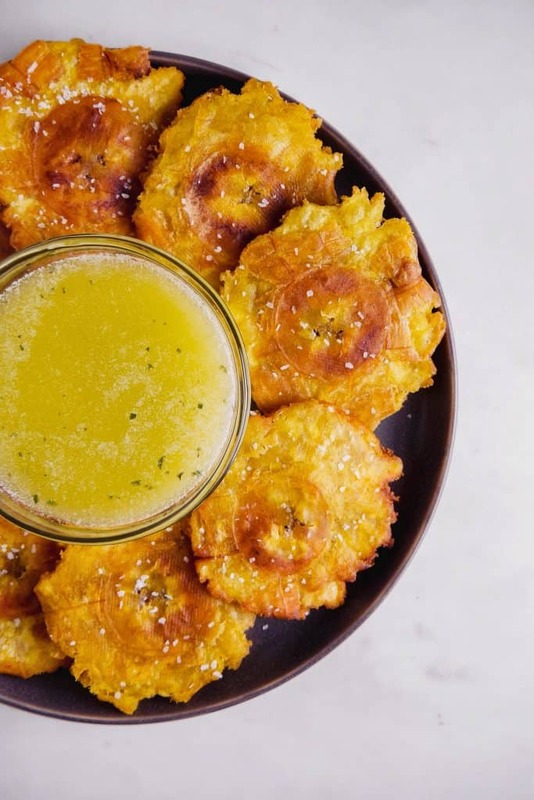 You’ll be using the oil again, so you can temporarily lower the heat or keep it on if you’re flattening while the other plantains are still cooking. I’m not so great at multitasking so I lowered it. If you lower the heat, just remember to bring it back up to temperature before the 2nd cook. So onto the smushing, if you have a tortilla/tostone maker you can def use one of those, but I used the top to my salt jar (true MacGyver over here…). You just want a flat surface to press them down. Once they are flat we are going to crisp them up just a little bit more. Add them back to the oil and cook about 1 minute each side. When done, place on a plate lined with paper towel to absorb any excess oil and salt bae those bad boys (sprinkle some salt on top). Next we are going to make a garlic dipping sauce. You can of course make whatever sauce you want or go no sauce at all, but as we know I am obsessed with garlic so garlic dipping sauce it is! What I did was take 3 tbsp of butter, grated 4 cloves of garlic, some olive oil and a touch of dried parsley. 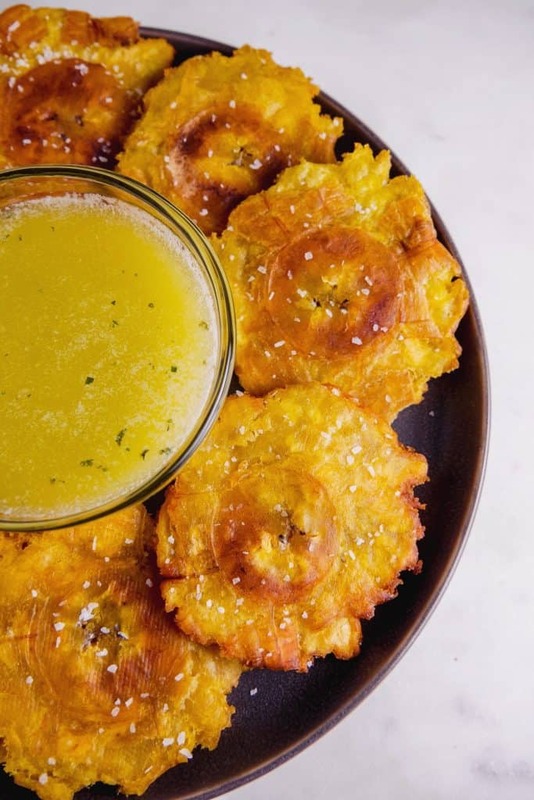 You might scare some vampires away, but it goes so well with the tostones! 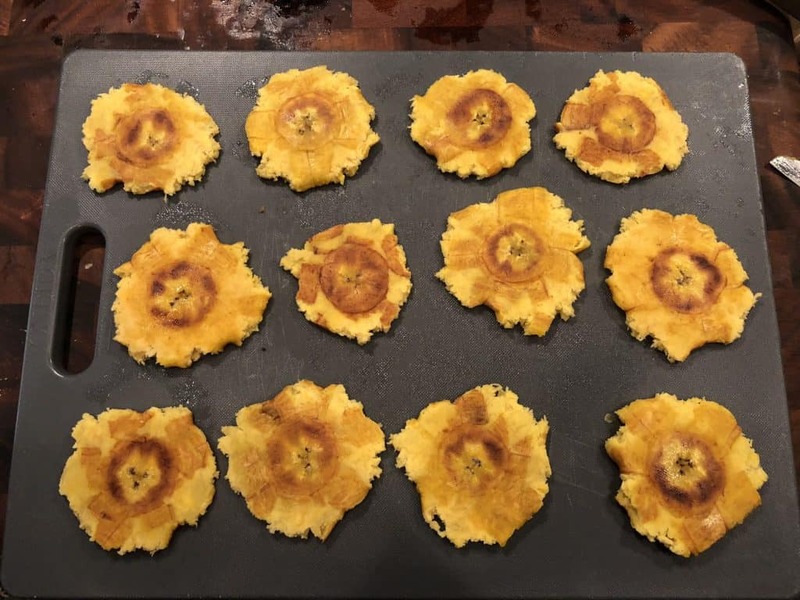 There you have it, easy crispy tostones! 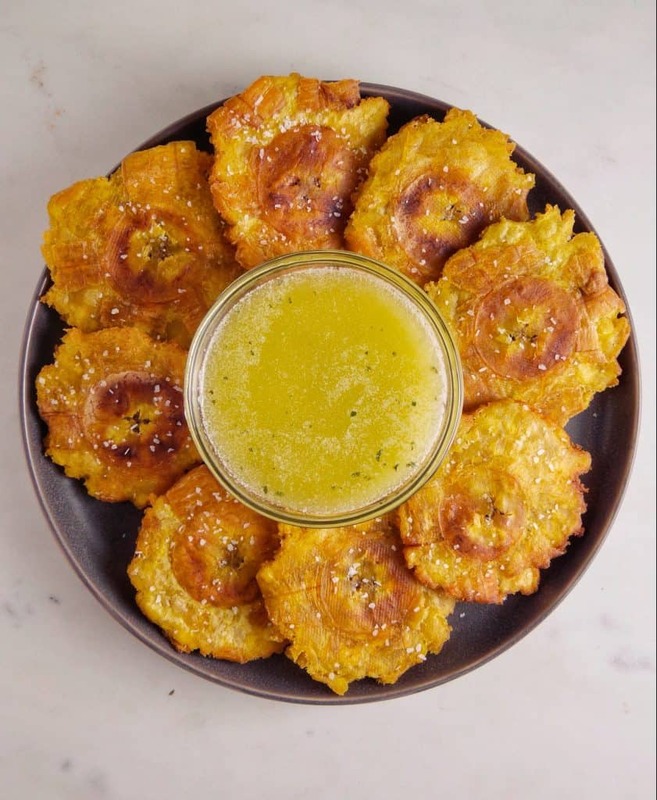 Things you’ll need: Cast iron skillet or dutch oven to fry, a flat item to flatten plantains, tongs, plate with paper towels, small saucepan to heat up dipping sauce. 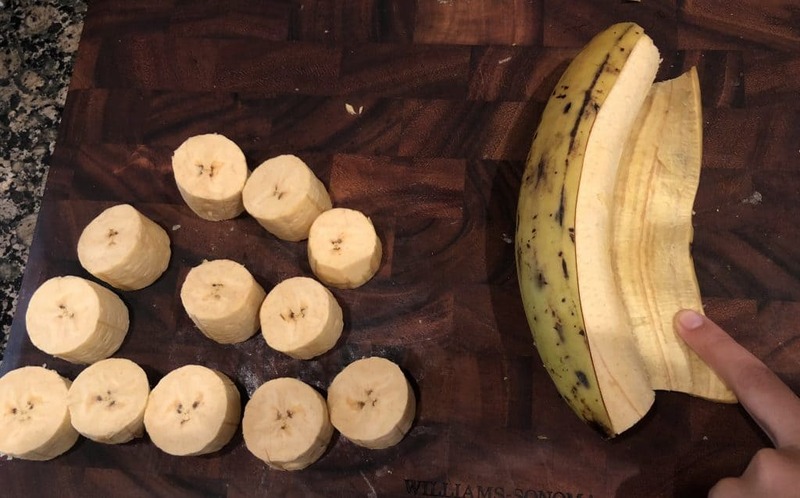 Prep the plantains: Cut the stems off the end and slice down the skin. Using a spoon or your finger, peel the plantain from it’s skin and cut into 1-inch pieces. In a cast iron skillet or dutch oven, fill with frying oil about 1/2 inch (quantity will vary depending on vessel size). Heat over high, when oil is hot and shimmering, place plantain cut side down and fry for 3-4 minutes till golden. Then flip and repeat on the other flat end. Remove from oil and place on a plate lined with paper towels to absorb excess oil. Repeat until all plantains have been done. 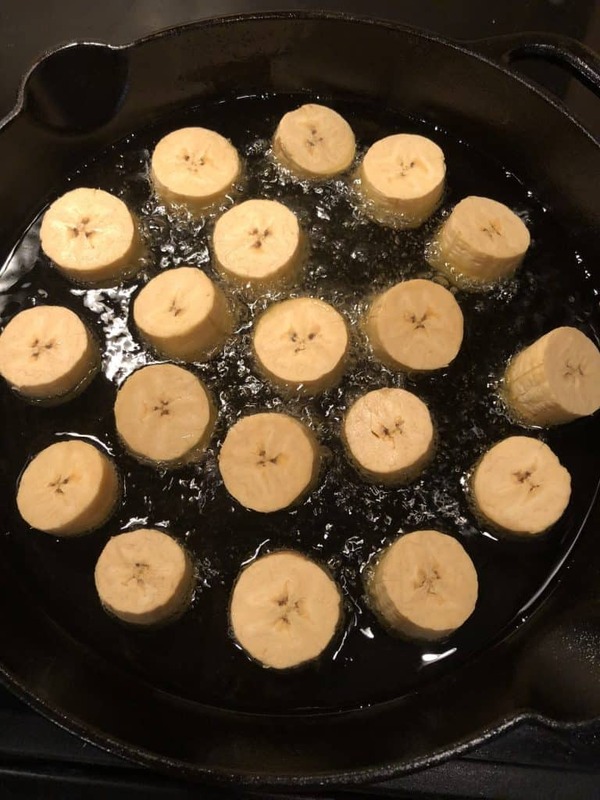 You can lower the heat for the next step, or proceed to cook plantains while you do the next step at the same time. If you lower the heat just remember to bring it back up to temperature for part two. 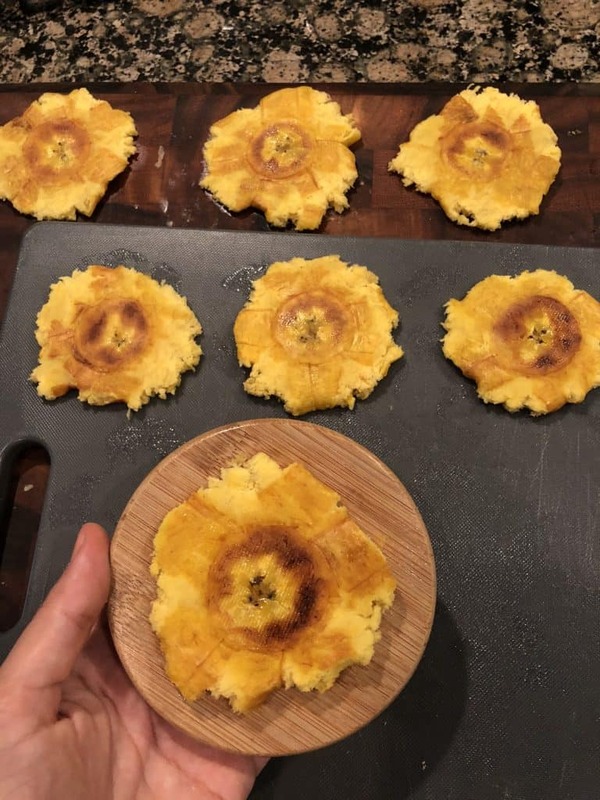 Using a plate or a flat surface item, carefully press plantain until it flattens. Add back to oil and cook for 1 minute on each side until crisp. Remove from oil and place on a plate lined with paper towels to drain excess oil. Season with salt on top. For the garlic butter sauce: Using a small skillet over medium heat, add ingredients and cook stirring for 3-4 minutes until butter has melted and garlic is fragrant. Add to a small bowl to dip tostones in.